Italians are notoriously good at defense – just look at all those walled cities up on the hilltops. Then there are the fences – many with a barking dog running the length of the property as you walk past. 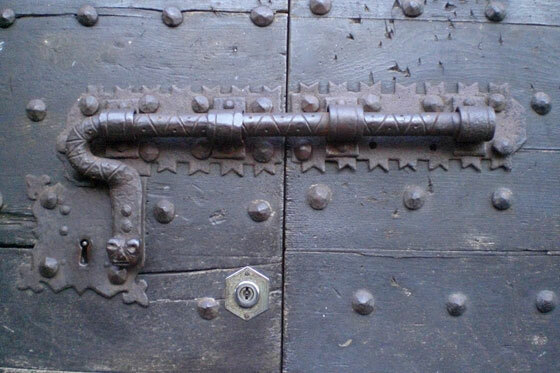 And then, the variety of doors, with locks and chains of all strengths and sizes. 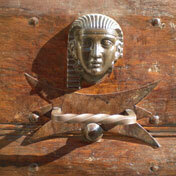 I’ve long been interested in doors as the gateway to something else. It’s an easy metaphor to use – barriers to what lies beyond or within, thresholds worth crossing to discover new territories for exploring. Opening doors in my work has always been a challenge, but one to which I keep returning. 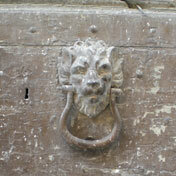 Maybe that’s why this time in Italy the rich abundance of physical doors has captured my attention. 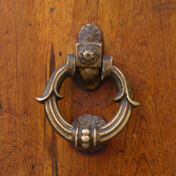 I’ve been collecting lots of photos of doors, knockers and knobs. 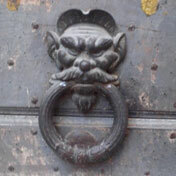 The next newsletter (coming soon), will have a handful more photos of doors and details. If you are not already subscribed, you can do so here. In the meantime, I’ve posted some new collages on the Italy Sketches page which you can reach by clicking here. At some point I’ll make it easier to find. For the time being, though, I’m having too much fun playing with Venetian Stucco, a material I’ve recently discovered. It’s a great surface on which to draw; and working with it appears to have opened some new doors!